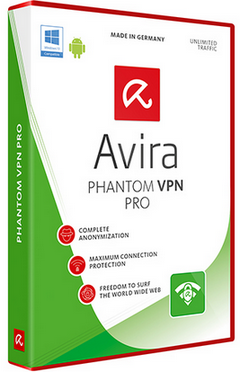 Avira Phantom VPN prevents online spies from seeing your communications (e.g. with friends, social networks, shopping/banking portals) on all networks, including unsecured open/public WiFi hotspots, by using AES 256-bit encryption between your device and our servers. 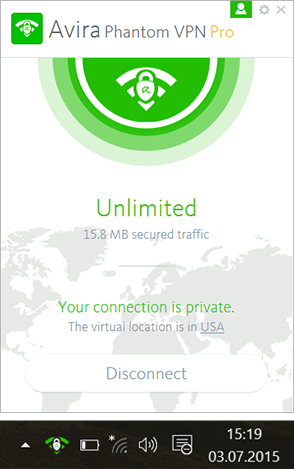 The VPN desktop icon is not created when installing the product as a bundle (FSS). VPN region selection is not working properly. * The difference Free version repacked from a Pro minimum. It is also possible vyponenie counter reset traffic and the limit is about 3Gb. But the Free version has a light interface (Pro — dark) and it is not available (not very important) a function of «Blocking traffic with an open VPN connection». The main difference Repack the Free version, it will be less dependence on self-renewal. Recommended primarily to those who have protective and cleaning software is not allowed to perform the repacking the necessary procedures to block the auto-update program. In addition, the Pro version uses an updated OpenVpn module from the current release version of the program. ** Reset the traffic counter is running AutoIt script is available from the start menu (Avira\Reset traffic counter). Systems included IAS starting to execute from the Administrator. Size: 0,69 / 4,36 / 12,82 MB. и не мудохаться с launcher'ом. Да можно качать откуда хотите, но есть ещё такая вещь, как дата цифровой подписи файла, обращали внимание? Что новее?